Mexico is a mega-diverse country where you can find some of the greatest number and diversity of animals and plants and whose landscapes are home to nearly 70% of global species. Mexico’s biodiversity has contributed over centuries to shape their culture, traditions, language, and practical teachings. Within Mexico’s spectacular mountain ranges, landscapes, climates, and coastlines on both the Pacific and the Atlantic Ocean, you can find “Pueblos Magicos” (small towns that are the hidden treasures of Mexico) which may be overlooked by travelers. These Magic towns are as diverse as its unique landscapes where culture, folklore, gastronomy, spirituality, and traditions give them its distinctive flavor. 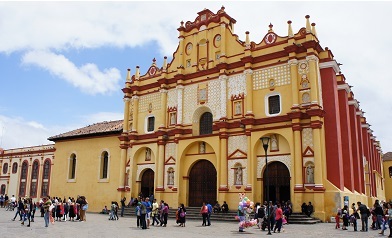 In these towns, you may find yourself enjoying the views sitting on top of a mountain, walking on cobblestone streets surrounded by colorful houses and small churches, shopping for handmade goods at the local markets filled with aromatic scents from fresh vegetables and fruits, visiting prehispanic ruins, attending local festivals, indigenous celebrations and so much more giving you a magical experience of the authentic Mexico. In an effort to highlight and recognize those beautiful towns and their inhabitants and to share their unique beauty, history, and culture, Mexico’s tourism department created the “Pueblos Magicos” Program in 2001. For a magical weekend experience exploring “Pueblos Magicos” near the US-Mexico border, we welcome you to visit Tecate in Baja California, Magdalena de Kino in Sonora, and Casas Grandes in Chihuahua. The state of Coahuila has easy access to several cities including Guerrero, Cuatro Cienegas, Candela, Parras de la Fuente, and Viesca, while Villa de Santiago and Linares are in Nuevo Leon. If you already have your next road trip planned, consider adding an extra day or two, to visit and experience the magic of one of these towns and continue to discover the beauty of Mexico.